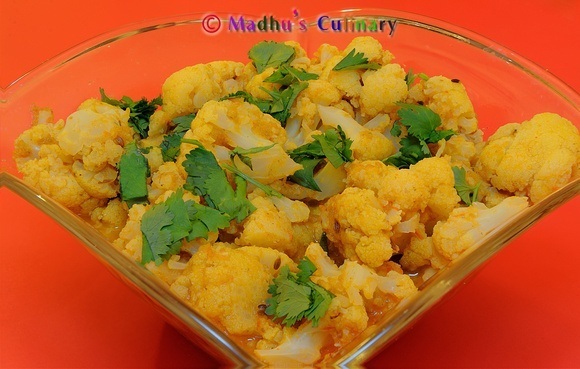 Aloo Gobi ->Suvayo Suvai | Simple Vegetarian Recipes, Easy to prepare and healthy to eat! 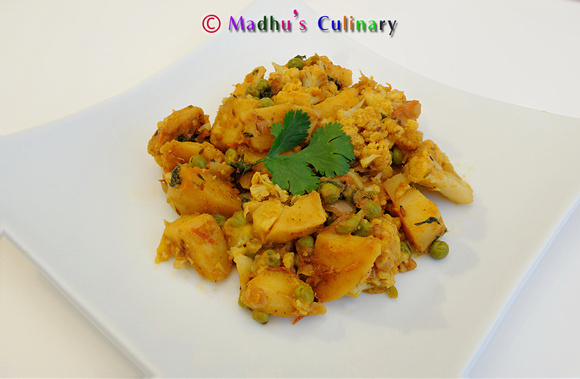 Spiced Potatoes and Cauliflower with Masala. Potatoes – 2 large, Peel the skin and cut into cubes. Take a kadai, heat the Oil and add Cumin Seeds and allow them to sizzle. 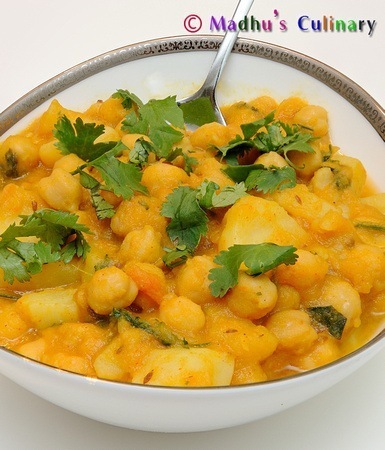 Add asofoetida, turmeric Powder and Onions, mix well and saute for 3-4 minutes. Add Ginger-garlic paste and green chili, mix and saute until Oil starts to separate from the onions and stir often. Add Tomatoes, mix and cook until Oil again separates from the mixture and stir often. 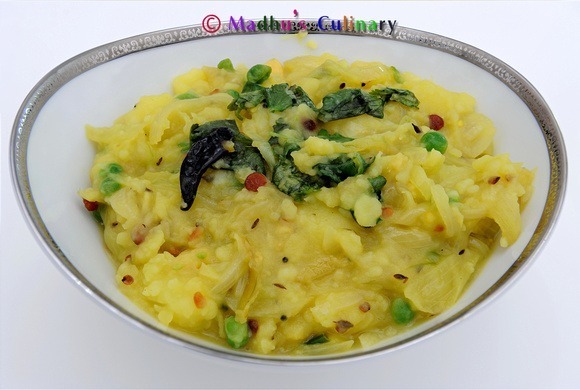 Take 1/4 cup of water add Coriander Powder, Red Chili Powder, Dry Mango Powder and mix it well.Pour the mixture.Let it cook for 1 minute. Add the dried fenugreek leaves and salt and mix well. Add the chopped Potatoes, mix well. Cover the lid and let it cook for 5-10 minutes. When the potates are halfway cooked, add the cauliflower and mix it well. Let it cook for 5 minutes. Sprinkle some water if needed. 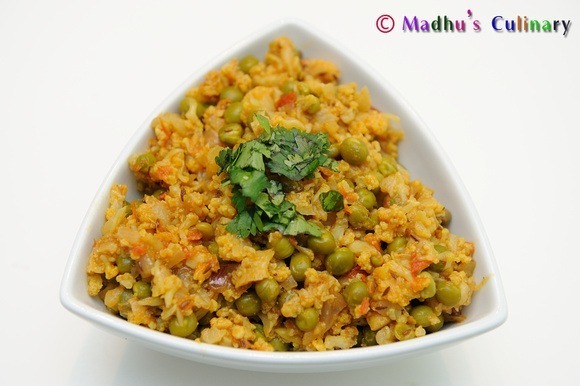 Add Green Peas and mix it gently. Cover and cook until all veggies are tender but not mushy and breaking apart. Finally add the garam masala mix it well. Garnish with chopped Cilantro (Coriander) Leaves. 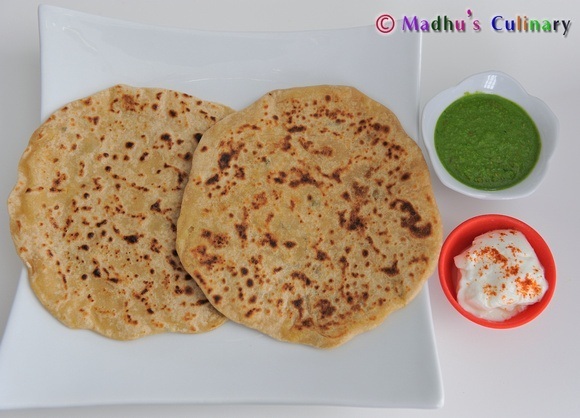 Serve it hot with Chapatti, Paratha or Rice. If you want the gravy consistency, add little more water.